When you’re expecting guests and you want to serve them with delicious snacks or appetizers this vegan recipe for Mini Dal Samosa (lentil stuffed fried pastry) is the perfect choice. 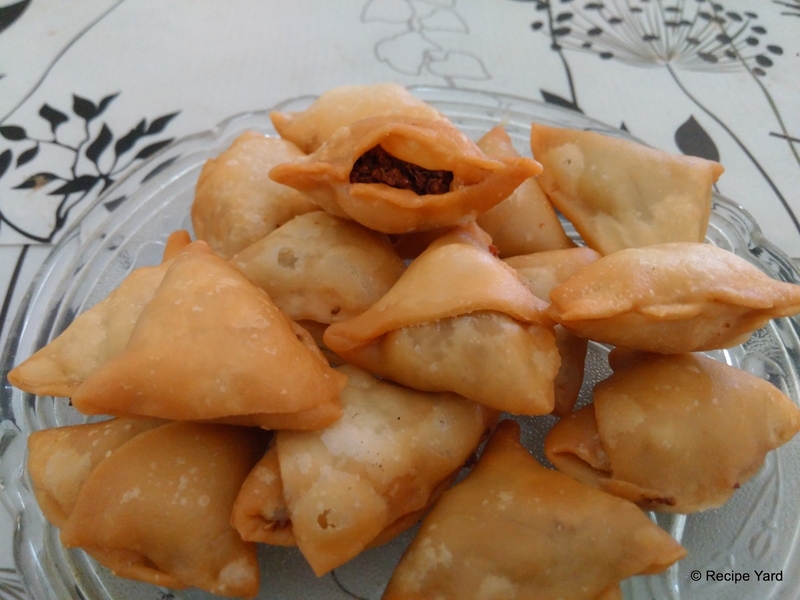 These mini samosas are delicious and very presentable. You can prepare them a little ahead of the serving time, enabling you to attend your guests warmly. Combine all purpose flour with salt and ¼ cup of vegetable oil in a mixing bowl. Stir to mix using your hands then pour lukewarm water to knead into tight dough. Cover the dough with a damp cloth and keep aside for half an hour. Meanwhile, drain out lentils and add them into fresh water. Rub with your hands so as to peel off the skin. Drain out lentils and add into a blender along with scrubbed ginger root and green chili. Pulse a few times to make a coarse paste. Do not add water during grinding. Put a pan over medium heat with 2 tbsp vegetable oil in it. Add cumin seeds and asafoetida; stir and tamper then add in coriander seeds powder, anise powder and lentils paste. Stir and roast for 3 to 4 minutes. Stir in red chili powder, garam masala, dried mango powder and salt to taste, cook for a couple of minutes or until lentil mixture is dried up and lightly browned. Remove from heat and sprinkle with chat masala; stir to mix well evenly. Take small portion of dough in your hand and roll into a ball shape. Place it on a lightly greased flat surface or rolling board and press gently with your palm to flatten a bit then roll into a 4 inch size circular disc using your rolling pin. Cut the disc into two equal half moons. Take one piece at your palm and moist the cut edge with your wet finger, then join from cut side overlapping slightly to make a cone. Fill the cone with 1 or 1 ½ tsp of prepared filling and then moisten the top edge of the dough cone and join together to cover the filling from top. Press the joined edges with your fingers to seal the tops completely. Place the stuffed samosa on a plate or tray and repeat the process to prepare more from remaining dough and filling. Put a wok or skillet over medium-high heat with enough oil in it for deep frying. Slide 6 or 8 stuffed samosa in hot oil, do not overcrowd the wok. Fry for a minute then reduce heat to medium and fry for 8 to 10 minutes or until golden brown from all sides while flipping the sides using slotted spatula. Drain out using fried samosa and transfer onto paper towel lined tray so as to soak excessive oil. Repeat the process to fry all of the samosas. Serve right away warm or store in airtight container for later servings, enjoy.